The Netherlands has experienced quite a remarkable development in its self-employment level in the past two decades, almost fully driven by a steady increase in the number of solo self-employed; 2014 figures indicate that their number more than doubled since 1996 (from 397,000 to 808,000). 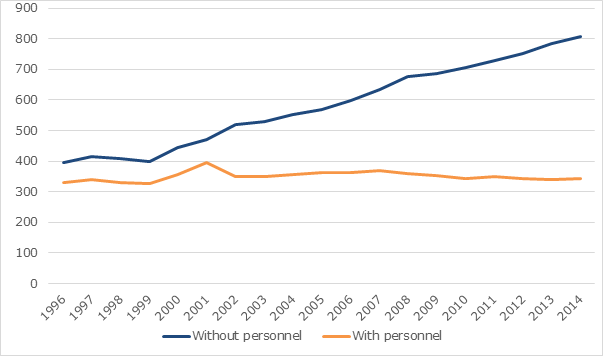 The number of self-employed with personnel has remained fairly constant in the same time period (see figure 1). The rise in solo self-employment can partly be attributed to factors like ageing, globalisation and technological change. However, these causes are not solely applicable to the Netherlands, and still, the share of solo self-employed in the Dutch labour force rose significantly faster than on average in the European Union (EU). The Netherlands therefore faces relatively severe consequences for its system of labour relations, social security and taxation. The main explanation has to be found in institutions that enlarged the difference in judicial and tax treatment between employed and self-employed. Dutch solo self-employed are entitled to numerous facilities that lower their tax burden and/or lead to higher allowances. This provides incentives for both the demand and supply of labour to favour solo self-employment over employment, i.e. to work with or to work as solo self-employed. Who benefits the most, either solo self-employed themselves or their client(s), depends on the parties’ bargaining power in the negotiation process about the entrepreneur’s hourly rate. Remarkably, the increase in the number of solo self-employed has not led to higher innovation levels at the macro level, a phenomenon coined the Dutch entrepreneurship paradox. Many solo self-employed perform routine tasks and do not have any growth ambition, but rather continue with what they are doing. Data from the Global Entrepreneurship Monitor (GEM) confirm that a vast majority of independent (early-stage) entrepreneurial activity in the Netherlands is not innovation-oriented. Still, approximately 2.5 percent of the Dutch adult population can be regarded as ambitious independent entrepreneurs (unfortunately, a category that only partly overlaps with self-employed, let alone solo self-employed). At the same time, the share of entrepreneurial employees appears to be more than twice as high (5.2 percent), amounting to over half a million paid employees creating added value for their employers. They do this, for example, by developing a new product or new product-market combination, making such employees innovative by definition. Entrepreneurial activity by employees, often also referred to as intrapreneurship, so far has been largely overlooked in policymaking, but is potentially more important for economic performance than independent forms of entrepreneurship. So although one could say that the Dutch government succeeded in stimulating (independent) entrepreneurship, they have been less successful in fostering innovation. A truly entrepreneurial society thus necessitates ambitious policies on ambitious entrepreneurship, thereby also taking into account a hitherto neglected form of entrepreneurial activity: intrapreneurship.